Regardless of what sport you are betting, there’s always one or two key numbers that you absolutely need to keep in mind. This article will explain why 5 is such a key number in NHL Over Under betting. When you’re betting NFL football, the difference between 5 and 5.5 on a point spread is virtually nothing, since football games are hardly ever decided by 5 points. But if you’re doing NHL Over Under betting, the difference between betting Over 5 and Over 5.5 is like the difference between drafting Sidney Crosby or Bing Crosby in your fantasy pool. Check out the difference in the odds at 5Dimes for the Over 5 in this Leafs/Lightning game, compared to the Over 5.5. The odds on the Over 5.5 are -125, which implies a 55.5% probability that there will be 6 goals or more scored in the game. But the odds on the Over 5 are an astronomical -310, suggesting there’s a 75.6% chance that there will be 5 goals or more. Is it really 20% less probable that there will be 6 goals in this game than 5? How can half a goal in NHL Over Under betting create such a massive gulf? It’s difficult to find any hard data online that breaks down the percentage of the time that 4 goals are scored in an NHL game compared to 5 goals, compared to 6, etc. We also manually compiled our own data from the first 10 weeks of the 2016-17 NHL season. And of the 523 games we looked at, 158 finished with exactly 5 goals scored. That’s a percentage of 30.2%! Okay, so 5 is an odd number. So what? That’s actually a really big deal – because NHL games don’t end in ties. And when you combine each team’s total in a tie game, you end up with an even number. So if the game is 2-2, which is pretty common in the NHL these days, you’re guaranteed there will be 1 extra goal. In that situation, if you bet Over 5, you’re guaranteed at least a push, even if the game goes to overtime. If you bet Over 5.5, however, you still need to hope for 2 more goals in the game – and teams will often tighten up defensively in a tie game once it gets to the third period, trying to make sure they get at least one point for a regulation time tie. 9 NHL games tonight and 7 of them decided by one goal. 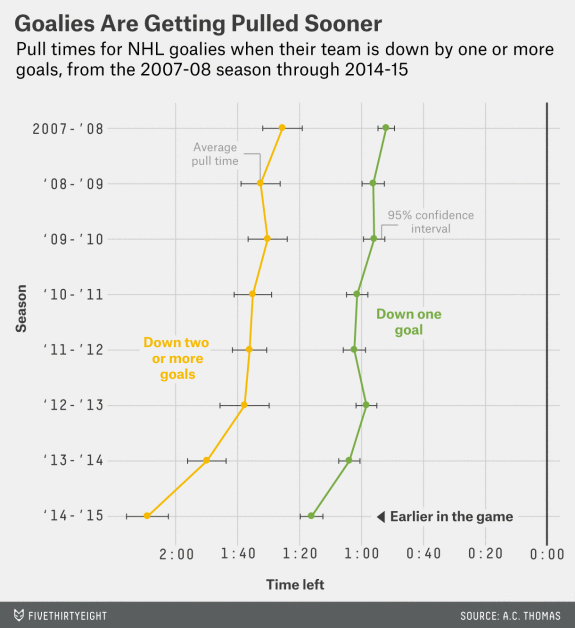 It’s incredibly close… 51.5% of all games this year have been one-goal games. NHL hockey games have never been more tightly contested. The lower scoring in the league and the addition of the single point for OT losses has led to way more 1-goal games. 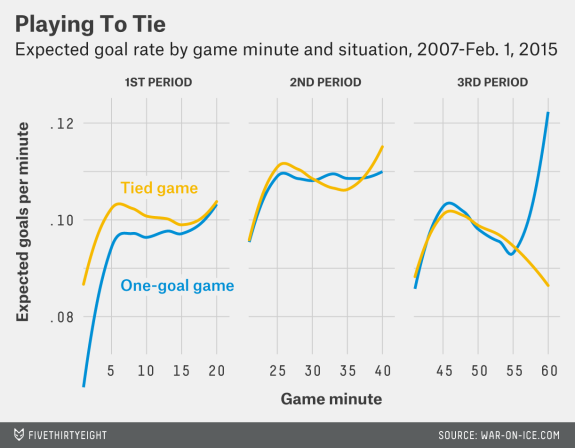 In fact, nearly a quarter of all games are tied at the end of regulation time, requiring OT or a shootout to decide. If you bet Over 5, you can push your bet if the score finishes 3-2. But if you bet Over 5.5, you’re either requiring one team to win by more than 1 goal (4-2, 5-1 or 6-0) or requiring both teams to score 3+ goals. Neither are frequent occurrences in this day and age of the NHL. Now that you understand the significant difference between betting Over 5 and Over 5.5, how can you apply this to your hockey betting in order to win some more bets? The matchup may scream offensive fireworks to you. But don’t forget that in order to cash your Over 5.5 bet, at least 1 team is going to have to score 4 goals or more. And if it’s not a competitive game, they might even need to get 5. Sometimes laying the heavier juice is worth it. The steeper odds on your bet, the more likely you are to win it – at least in theory. In the above example, the Over 5.5 is +115 odds and the Over 5 is -145. That suggests there’s a 46.5% chance of there being more than 5 goals in the game, and a 59.1% chance of there being 5 goals or more. If you feel there’s a better than 60% chance that each team gets to 2 goals tonight, you might want to bet the Over 5 at -145 instead of sticking your neck out for the extra goal at +115 odds. It’s always nice to have that extra security of the potential for a push, even though you’ll still need 6 goals to cash your bet. You’ve also got a chance of an empty netter helping you out to get to 5. We haven’t found any exact statistics to back us up, but we’ve noticed there seems to be a lot more empty netters in 2-goal games than 1-goal games, likely because teams pull their goalie for an extra attacker earlier because they need 2 goals to tie, not 1. A 3-1 game can turn into a 4-1 game and get you your push. But you won’t find any teams pulling their goalie down 4-1 to help you cash that Over 5.5 ticket. Gone are the days when you could only bet the moneyline, puck line and Over/Under on an NHL matchup. 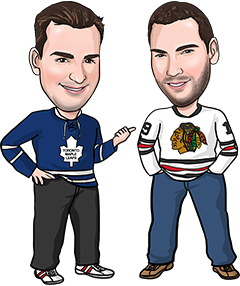 Thanks to the surge in popularity of online hockey betting, you now have lots of ways to take advantage of a certain angle you like on a game. That includes NHL over under betting. If you love the Over in a game but are reluctant to bet Over 5.5 because of the reasons we listed earlier, here are 3 ways you can make a similar bet at better odds. Take Over on a team total: If you’re expecting more than 5.5 goals in the game, 1 team’s going to have to score at least 4 goals. So why not check out the team totals odds instead? You can often bet a team Over 2.5 goals for -140 odds or less, or occasionally bet Over 3.5 goals for some plus money. Play the Over in live betting: No matter how high scoring the game is, it often takes a few minutes for a team to score the first goal. If you bet the Over using NHL live betting, you can almost always get better odds on the Over 5.5 – or the total might even drop down to 5 if there’s a slow start to the game. This strategy works great at Bet365. Bet Over 6 instead: Whoa, you thought we were trying to make things easier, not harder, right? Well, it’s true that it’s a bit harder to win your Over bet if you bet the Over 6, but you won’t lose more bets this way (you’ll push instead of winning games that end with 6 goals) – and you can get better payout in return. We wrote an article that explains why betting Over 6 (or even Over 6.5) might make more sense than Over 5.5.